(Japan Times) KIEV — Ukraine on Thursday marked the 75th anniversary of the Babi Yar massacre, one of the most infamous mass slaughters of World War II. Babi Yar, a ravine in Kiev, is where nearly 34,000 Jews were killed within 48 hours in 1941 when the city was under Nazi occupation. The killing was carried out by SS troops along with local collaborators. 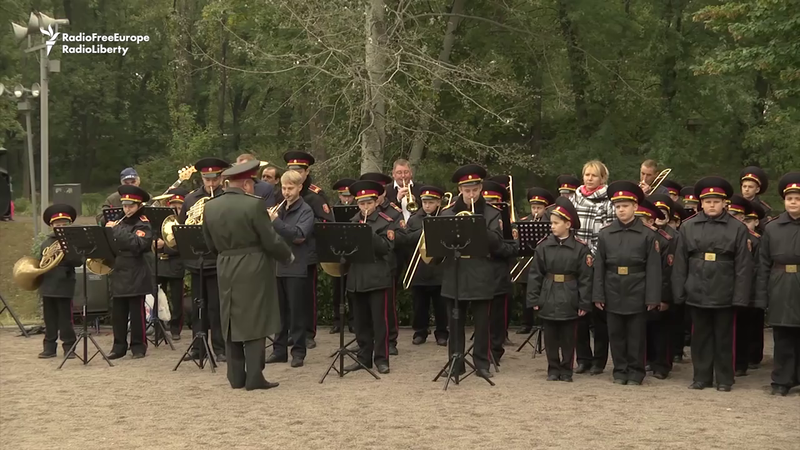 President Petro Poroshenko visited the Babi Yar monument on Thursday in a small commemoration that included people laying flowers. A larger ceremony was scheduled for the evening. President Poroshenko spoke at the commemoration, saying…“No Ukrainian has the right to forget this tragedy. 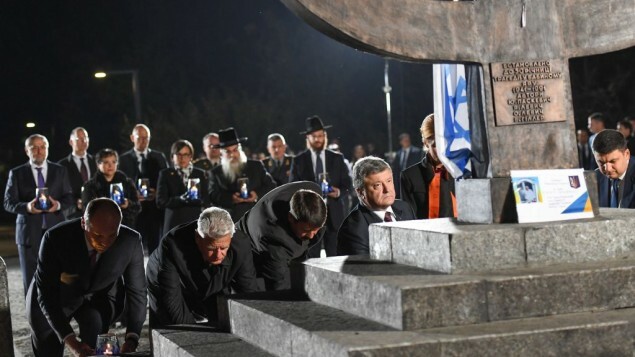 The lesson of Babi Yar is a reminder of the frightening price of political and moral nearsightedness.” Poroshenko made his remarks to a largely Jewish audience at a temporary stadium in Kiev’s Babi Yar park where the commemoration was held. The site encompasses a ravine on the city’s outskirts, where German SS troops systematically killed assembled Jews with machine guns on Sept. 29 and 30, 1941. “It’s a reminder that indulging an aggressor simply builds his appetite,” the president said. The Nazis and local auxiliaries exterminated the Jews between Sept. 29 and 30 of 1941 as they blitzed their way toward Moscow and captured major cities on the western Soviet flank. …Babi Yar is also rarely mentioned by locals. But the horror of those 48 hours are still vividly etched in the memories of survivors such as Raisa Maistrenko, who was only 3 years old when her 18 relatives failed to return from the ravine. Just 29 people managed to escape execution by either falling into the mass grave before being shot in the back or by wearing crosses to hide their true religion. Maistrenko said they were hiding there until sunset before finding their way back home under the cover of darkness. There — to their relief — no one reported them to the Nazis. (The Wall Street Journal) BOGOTÁ, Colombia — On Sunday, voters narrowly rejected a peace accord between President Juan Manuel Santos and a Marxist rebel group that would have ended 52 years of conflict, a startling outcome that thrusts this country into uncertainty. …The vote in Colombia came barely a month after the government and the Marxist Armed Revolutionary Forces of Colombia, or FARC, concluded four years of peace negotiations in Cuba. Polls had earlier shown the “Yes” vote comfortably winning the referendum. With 99.9% of votes counted, “No” votes (totaling more than 6.4 million) outnumbered “Yes” votes by fewer than 54,000. 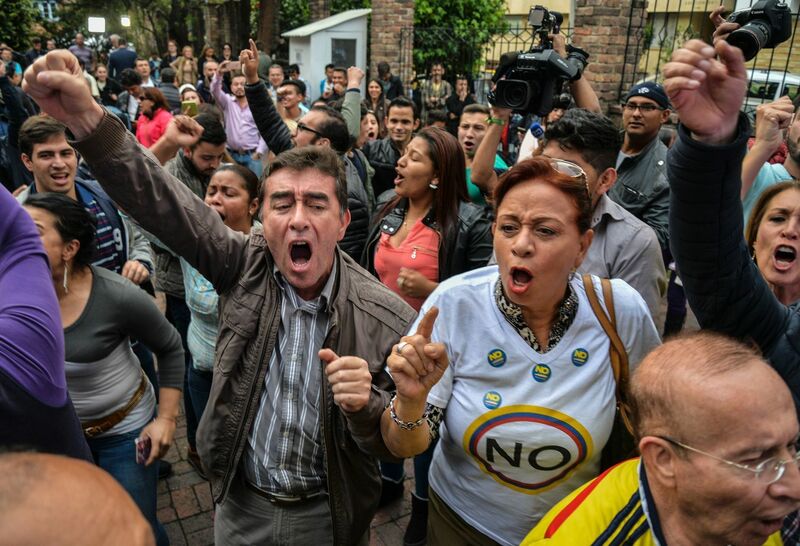 The “No” vote won throughout most of central Colombia, including heavily populated Antioquia, an economic engine for Colombia, and other interior states deeply affected by guerrilla violence. Bogotá, with eight million people, voted “Yes” and so did other states in the southwest where conflict once raged. But the size of the vote in those regions wasn’t enough to turn back seething anger against FARC and Mr. Santos’s accord. After the results of the vote were released, half the country was stunned, while the other half celebrated, with drivers honking horns on city streets. President Santos’s loss is a victory for his predecessor, former President Álvaro Uribe, who marshaled his followers by asserting that the accord would permit FARC to install a communist system in this country of 49 million. 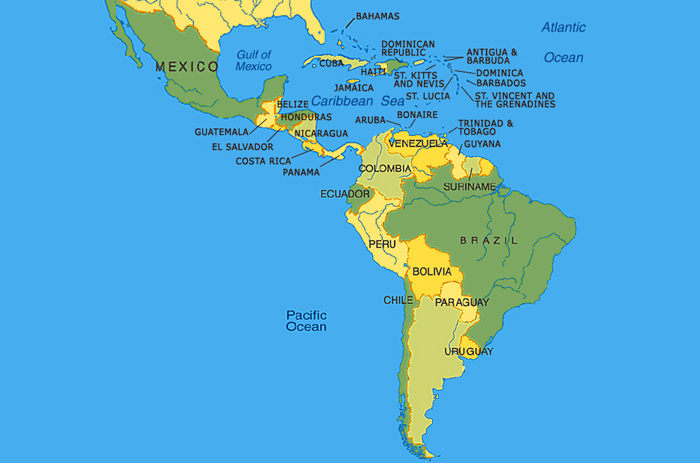 The Santos administration had touted the development and economic-growth potential that peace would bring in a country ravaged by a drug-fueled war, noting that one of the points in the accord amounted to a Marshall Plan [whereby Colombia would be given money from allies]. This year, the Obama administration had pledged $450 million to aid the postconflict process, one of several commitments made by Colombia’s allies. Mr. Santos’s accord also had the support of Latin America, the EU and the Vatican. FARC, which spent more than five decades trying to topple the Colombian state, had in the negotiations abandoned many of the demands it had long fought for, such as changing the country’s capitalist system, barring foreign ownership of land and implanting radical land overhauls. But benefits for ex-combatants stipulated in the peace accord—including seats in Congress for guerrilla commanders and leniency in tribunals for those accused of atrocities—prompted many Colombians to reject the deal. “After all of the damage and violence that the guerrillas have caused, they wanted us to treat them like prizewinners,” said 46-year-old maintenance worker Dairo Aguilar, whose family was forced to the capital from their village in southern Colombia by the conflict. He voted against the deal. Mr. Santos banked his presidency on ending a conflict that since 1964 left more than 220,000 dead and forced millions of poor farmers off their land. A victory for the “No” campaign would lead to a resurgence in conflict, Mr. Santos had warned, irking many in Colombia who said the warnings amounted to a scare tactic. FARC leaders have been more ambivalent in public comments. In a recent interview, a guerrilla who used the name Paula Saenz said the rejection of the accord wouldn’t mean war, at least not yet. “It’s not like we will begin to blow up bridges,” she said, although she shook her head when asked just what the guerrillas might do. 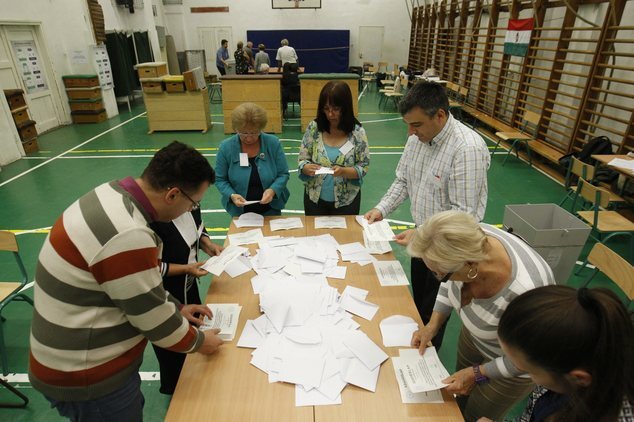 (CNN) – Hungarians voted Sunday to reject a forced European Union refugee resettlement plan, but failed to turn out in sufficient numbers to make the referendum legally binding. Voter turnout was 43.7%, short of the 50% participation required to make the referendum valid under Hungarian law. Gulyás Gergely, the Vice-President of Hungary’s ruling party, FIDESZ, … said that more than 90% of those who voted supported Prime Minister Viktor Orban’s “No” position. In a Sunday evening television address, Prime Minister Orban said the European Union cannot force migration policies on Hungary and vowed to fight any efforts to do so. “Can a democratic community [the EU] force its will to a member where 92% [of the voters] is against it? I promise, I will do everything so this can never ever happen,” he said. Earlier on Sunday, Orban told reporters that his government would “start to negotiate the modification of the Hungarian constitution” if the referendum fell short of the 50% turnout needed to make it valid. Orban had spearheaded a campaign asking Hungarians to reject EU migrant quotas for the country. …”We lose our European values and identity the way frogs are cooked in slowly heating water,” Orban said Friday. “Quite simply, slowly there will be more and more Muslims, and we will no longer recognize Europe. What we have seen so far from the people’s migration have only been warmup rounds. The real battle is yet to come,” he added. 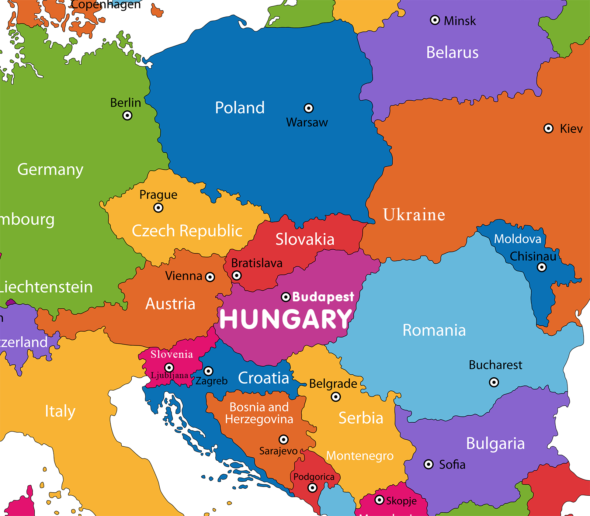 Under the agreement with the European Union reached last fall, Hungary would have to accept 1,294 refugees. Last year, when a mass exodus of refugees from Syria and Iraq and economic migrants from other mainly African countries flooded the Hungarian border, strict measures …were put in place. Hungarian riot police used tear gas and water cannons at the country’s border with Serbia last year after a group of migrants attempting to enter the European Union broke through a barrier. Hungary has recently erected a razor-wire fence that runs the entire length of the country’s borders with Serbia and Croatia. Migrants from the Middle East and southeast Asia often cross the Mediterranean and try to go through Greece, Macedonia, Serbia, Hungary and Austria in an attempt to reach Germany or other European countries known to give refugees [more benefits including food, places to live, education and medical care]. b) Define the term collaborator as used in this article. c) What was the Babi Yar massacre? Be specific. d) In comparison to Ukrainians who collaborated with the Nazis, what opposite actions did others take? e) Why do you think it is important for every Ukrainian to mark this horrific massacre? b) What demands did the Marxist FARC guerrillas have that were not agreed to by President Santos and government negotiators? c) What benefits were the FARC fighters given in the agreement that voters opposed? d) Read the “Background” below. Which governments consider FARC a terrorist group? How many people did FARC kidnap during its reign of terror? How many people have been killed by FARC during that time? Do you agree with Mary Anastasia O’Grady’s assertions about President Santos and the peace deal with FARC? Explain your answer. b) What percentage of Hungarian voters turned out in Sunday’s referendum question? What percent of these voters agreed with President Orban? c) If the vast majority of voters voted to reject the EU requirements, why isn’t the referendum valid? d) The media, the EU, US and UN criticize President Orban. Do you think President Orban is a xenophobe, or does he make valid points? Explain your answer. The German army took Kiev on September 19, 1941 and special SS squads prepared to carry out Nazi leader Adolf Hitler’s orders to exterminate all Jews that Soviet officials found there. Beginning on September 29, more than 30,000 Jews were marched in small groups to the Babi Yar ravine to the north of the city, ordered to strip naked, and then machine-gunned into the ravine. The massacre ended on September 30, and the dead and wounded alike were covered over with dirt and rock. On September 29-30, 1941, SS and German police units and their auxiliaries, under guidance of members of Einsatzgruppe (mobile killing unit) C, murdered the Jewish population of Kiev at Babi Yar, a ravine northwest of the city. This was one of the largest mass murders at an individual location during World War II. As the victims moved into the ravine, Einsatzgruppe detachments shot them in small groups. According to reports by the Einsatzgruppe to headquarters, 33,771 Jews were massacred in two days. In the months following the massacre, German authorities stationed at Kiev killed thousands more Jews at Babi Yar, as well as non-Jews including Roma (Gypsies), Communists, and Soviet prisoners of war. It is estimated that some 100,000 people were murdered at Babi Yar. The FARC has long used violence, kidnappings, and extortion as sources of leverage and income. Colombia’s National Center for Historical Memory estimates that guerrilla groups kidnapped twenty-five thousand people (PDF) between 1970 and 2010. More than ten thousand people, including nearly four thousand civilians, have been killed or maimed in landmine explosions, most of which were planted by the FARC, according the Colombian government. The result of Sunday’s vote emboldens Mr. Santos’s detractors, led by former President Alvaro Uribe, now a senator. He had campaigned saying the peace deal could be renegotiated with stricter penalties for rebels accused of war atrocities. Mr. Uribe, whose heavy military offensive against FARC during much of the past decade decimated the guerrilla group, remains highly popular in Colombia. Indeed, many here believe that Mr. Santos should have finished off what Mr. Uribe began, though military experts, including generals in the army here, were supportive of the negotiations and saw the accords as the best way to end the conflict. However, it remains unclear how the government and FARC would redefine terms for future negotiations after both sides had exhausted much of their political capital working on the 297-page agreement. Juan Pablo Vega, a rancher in northwest Colombia, a region marked by FARC kidnappings, summed up the opposition to the accords, saying he didn’t want to see the rebels in politics after having committed so many atrocities.